Mera blood is fully a non-profit organization. Our mission is to serve the humanity. Mera blood is deep-seated to serve the people and make blood searching and donating a very simple and easy process. Lives of thousands people are waiting for your blood donation. Your blood may save some one’s life. Mind it; lives of 90% of us rely on remaining 10%’s blood donation. Be first in this noble deed because mera blood is tera blood. 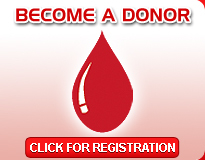 Donate blood to save the lives without waiting for a call or any emergency. Give blood and share life. Remember Blood has no substitute but whole life depends on it. Leave something worthwhile behind you, serve the nation, donate blood and save more lives. Mera blood may help to save lives of your beloved. Please don’t ignore it, its very important for our Pakistan. Don’t leave it to do some one else because your blood is the guarantee of another life and another’s blood is the message of life of your dear one.